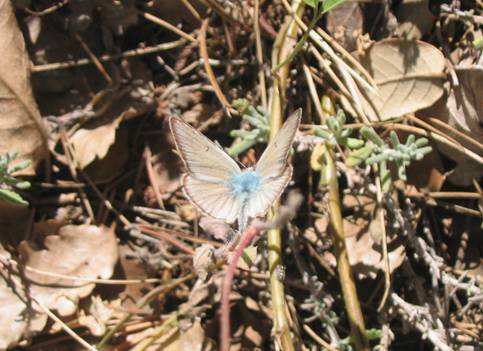 The Furry Blue is an interesting butterfly of a few warm, southerly locations in France, Spain and Italy. The habitat at the location in the Var in 2004 was very interesting. It consisted of a completely dried up stream with a solid, rocky bed and shrubby edges. Bordering the stream was some excessively dried up, 'damp' grassland, that is to say it was obviously damp grassland at other times of the year. This grassland was spread out beneath some sparse pine woodland and interspersed with oak scrub. 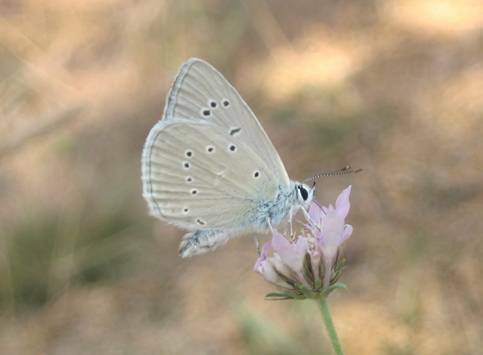 The butterflies were scarce.......just occasionally one would flit across the grassland, nectar on a few flowers, then disappear. A couple of females turned up in this way and three or four males. The male is a rather pale creature on both surfaces. 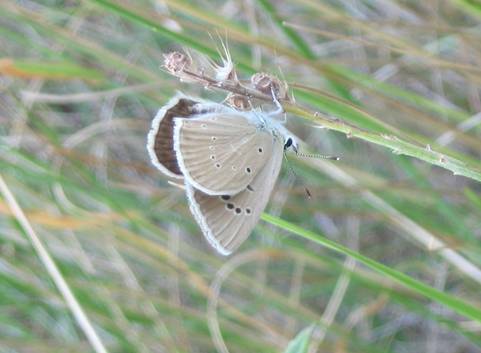 The undersides are just tinted with beige and the supposed white streak through the hindwing is utterly vestigial, only visible at certain angles. 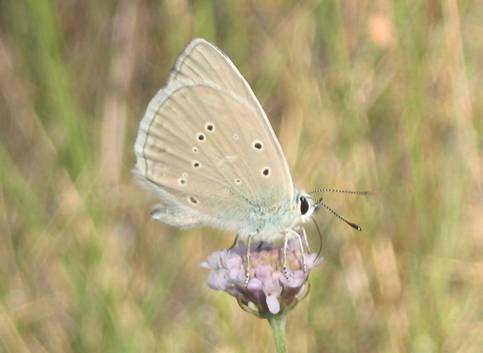 His upperside is a very pale blue and this combined with the pale underside and the reasonably large size sometimes makes him difficult to distinguish in flight from the Chalk-hill Blue family and Meleager's Blue.